If you come by bus or coach, indicate this in advance via the button below. You will receive a parking ticket and instructions for the driver from us via email. PAY ATTENTION! Registration is mandatory and free of charge, unregistered buses pay €35,- on the spot. REBiRTH Festival can be reached in different ways. For exact travel information, visit www.9292ov.nl. 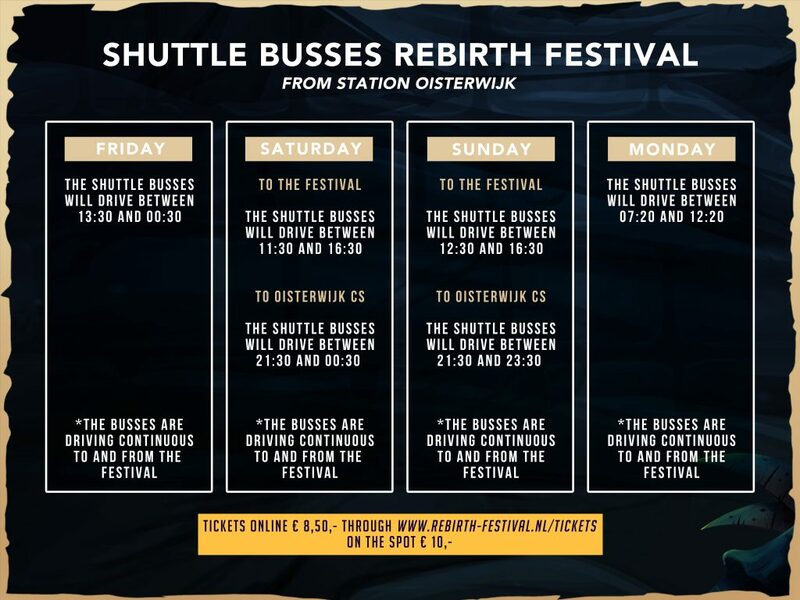 This year, shuttle busses operate according to a continuous schedule from Oisterwijk Station. The shuttle runs on Friday, Saturday, Sunday and Monday. Buy your shuttle bus ticket with 10% easy and fast through our ticketshop! There are various parking areas around the festival grounds. Follow the yellow traffic signs and only park at the indicated places. In the context of the environment, we would like to ask you to carpool as much as possible or to travel by public transport. Parking tickets for the festival parking and for the camping parking are available on site and in our ticket shop. Ihre ultimative Wochenderfahrung auf dem REBiRTH Residence! 2019 wird das REBiRTH Festival verlängert: 3 Tage Party – von Freitag bis Sonntag mit unserem nagelneuen REBiRTH Residence Camping! Mit zahlreichen Aktivitäten, z. B. die Pre-Party, Silent Disco, Filmtheater und Raw Workout. Informieren Sie sich über Tickets und Arrangement, z. B. das Friends Camp!